These angry comments made by Ukrainian President Petro Poroshenko at a recent rally in Kyiv refer to the far-right National Corps party. In past weeks, National Corps activists have been following the president across the country, disrupting his public events with corruption accusations. Yesterday’s darlings of Ukraine’s mainstream patriotic public, National Corps have been suddenly reclassified by Poroshenko’s media machine from “heroic defenders of Mariupol” who reclaimed the southeastern city from separatist forces in May 2014, to “dangerous paramilitaries with ties to Russia”. This shift tells us a lot about the unusual conjuncture in which the country has found itself on the eve of major elections. Russia, and specifically Vladimir Putin, is the main antagonist in the discourse of Ukraine’s incumbent president, who is desperately trying to get reelected. Even though the country’s economic situation seems to have improved after the freefall of 2014, this is little comfort for people whose incomes are meager enough to provoke a massive wave of labour emigration over the last few years. 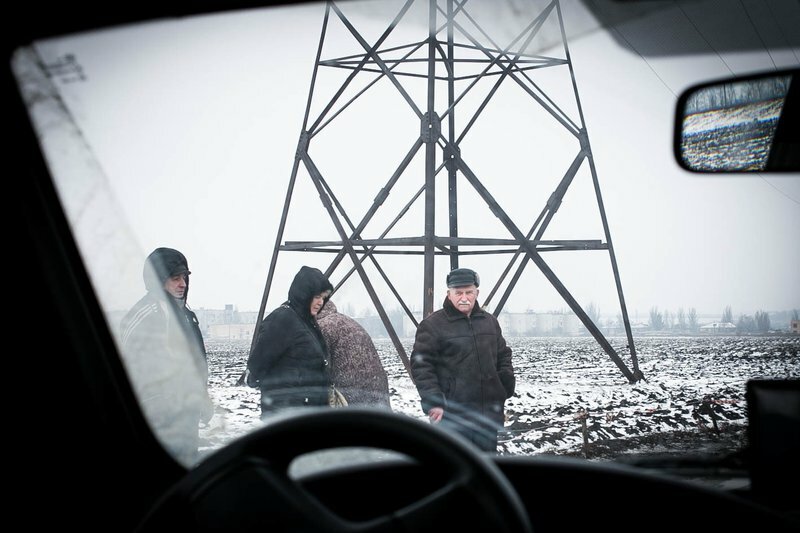 Those who stay behind have to deal with enormous hikes of home heating costs, crumbling physical infrastructure, and the protracted military conflict in the east of the country – which Poroshenko famously promised to end in two weeks during his first election campaign five years ago. All these issues, which have become easy targets for Poroshenko’s opponents, are real enough to seriously jeopardise his chances of re-election. 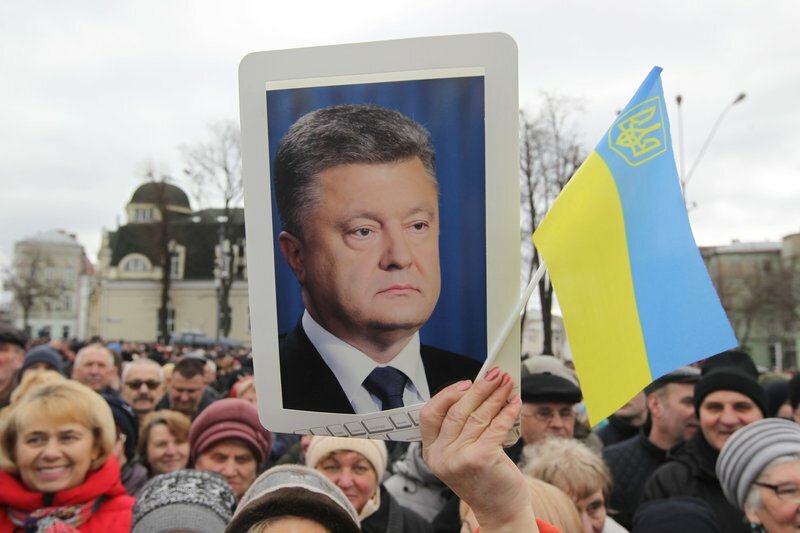 Having won the 2014 presidential elections in a landslide, today it is unclear whether Poroshenko will clear the first round of voting on 31 March. To counter the wave of gloomy media reports, pro-presidential media and bloggers have started routinely mocking voters who can only whine about the “genocide” and “total pauperisation” of the Ukrainian people, and thus ignore all the positive developments and real achievements of Poroshenko in the past five years – for instance, Ukraine’s visa-free regime with the EU. But while these “zradophiles” (a neologism from the Ukrainian word for “treason”) can sometimes be overdramatic, this campaign of forced optimism is hardly convincing beyond the usual circles of middle-class Facebook users. Aiming for a wider audience, the President has built his campaign on a three-word slogan: “Army, language, faith”. The last element of this national conservative triad is exemplified in the recent secession of the Ukrainian Orthodox Church from the Russian patriarchate. This split, widely known as the Tomos, has been widely popularised across the whole country as Poroshenko’s personal achievement. This goes along with moves towards the general strengthening of the conservative agenda, much to the chagrin of Poroshenko’s liberal supporters who previously valued him as a defender of gender and cultural diversity. For example, the President, anxious to gain the support of a more significant share of voters, recently joined a number of other high-ranking officials at a “National Family Forum” in Kyiv. Never before has this annual gathering of crusaders against the Istanbul Convention and women’s reproductive rights seen this number of VIP attendants, which also included presidential candidate Yulia Tymoshenko. While Poroshenko’s personal declarations are limited to general support for “family values”, Oleksandr Turchynov, secretary of Ukraine’s National Security and Defence Council, is waging an all-out war against harmful “gender ideology”. As for “language”, Poroshenko has decisively abandoned his rhetoric of “civic nationalism” from 2014, symbolised by the ubiquitous slogan “One country”, written in Ukrainian and Russian. Instead, he has returned to the traditional strategy of ethno-linguistic polarisation, which has served Ukrainian elites well since the political campaigns of the 1990s. 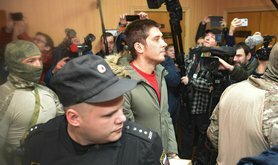 Previously, “language laws” have been used by opposing political forces to stir conflict in society and centre debates in the public sphere around identity issues – only for this feeling to be later converted into votes for such divergent groups as the Party of Regions and militant Ukrainian nationalist party Svoboda, as in the case of the 2012 parliamentary election. 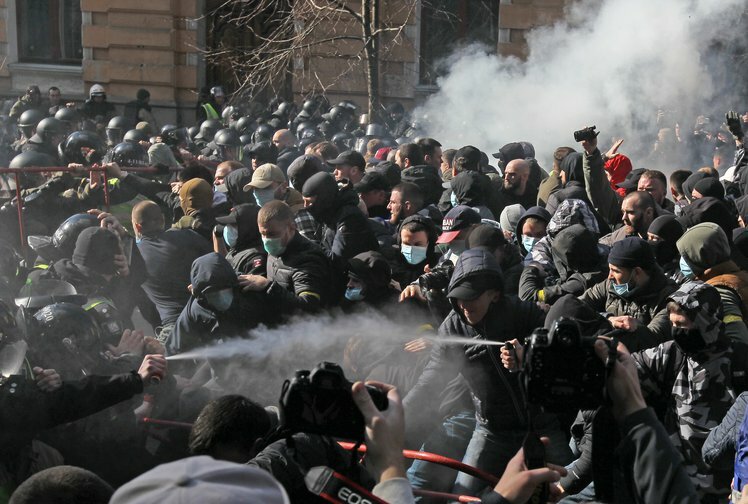 In February 2014, an attempt to repeal a Yanukovych-era law protecting the Russian language was one of the first steps of the Maidan coalition, which contributed to unfolding protests against the new government in Russian-speaking regions in the southeast. Today, as elections draw closer, the Ukrainian parliament is discussing draft legislation, supported by Poroshenko, that will further expand the mandatory use of Ukrainian language at the expense of other languages – once again whipping up identitarian passions weeks before the election. Until 2014, this kind of polarisation was a game for two players in Ukraine: different political camps used this tool to easily harvest votes in their respective, more or less equally-sized, regions. It was also a kind of backstop against authoritarianism: whenever a political force attempted to consolidate power, the opposition easily mobilised support among voters with a “different” identity. However, the annexation of Crimea and conflict in Donbas has tipped the balance. Without these regions, the “pro-Ukrainian” nationalist voting base became numerically larger than the carriers of “Russophone” identity. 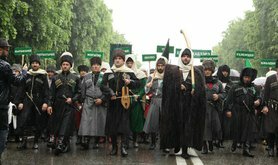 Moreover, even in regions that stayed under Ukrainian government control, the “pro-Russian” version of nationalism has been silenced and in many instances simply criminalised – even if its carriers are still around, they are considered a fifth column rather than a legitimate part of Ukrainian society. This means that Poroshenko can feel free to push the ethno-nationalist button as hard as he likes: a “pro-Russian” candidate, such as Yuriy Boyko or Oleksandr Vilkul, would be structurally unable to win in the second round – and therefore an ideal easy-to-beat opponent for the incumbent president. Without a noticeable liberal opposition, this is bad news for the prospects of democracy consolidation in Ukraine. Finally, the “army” part of the slogan is a natural choice for a leader of a country at war. Poroshenko is presented as the only politician possessing enough expertise and experience to ensure victory – or at least to prevent military defeat. These credentials are supported by a narrative about how Ukraine’s armed forces were weakened and almost completely destroyed by the preceding governments, and were then rebuilt from scratch by the incumbent president. To sum it up, the strategists of Poroshenko’s campaign present him as literally the sole alternative to Putin, discounting all other contenders as willing or unwilling puppets of the Russian leader. For many ordinary voters this translates into a feeling of existential dread, turning a routine political procedure into a matter of life and death: the defeat of Poroshenko will bring about Russian invasion and a “real” civil war. Poroshenko’s strategy suffered a severe blow when a team of investigative journalists published a major leak implicating Poroshenko’s close friends and partners in corruption schemes in Ukraine’s defense sector. Allegedly, these men bought old military equipment in Russia, smuggled it across the border and sold it to the Ukrainian state for much more than it was worth. As if things were not bad enough, the notorious National Corps then crystallised public rage in the form of street protests. The far-right activists harassed Poroshenko in the town of Cherkasy, where they almost chased him away from the stage. They now continue to follow Poroshenko on his presidential tour, attacking the police and demonstratively using force. 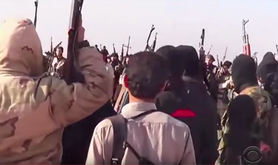 On election day, National Corps’ paramilitary wing, National Militias, will be present at polling stations as observers, and they have already promised to use force when needed. 9 March 2019: National Corps disrupt campaign event for President Poroshenko. Source: YouTube / Valera Mironenko. National Corps’ political patron, Interior Minister Arsen Avakov, shows the maximum degree of tolerance to this “righteous rage”. Given that Avakov’s main goal is to keep his current position after the elections, he started his own crusade against Poroshenko several weeks earlier, methodically accusing the president of violations of electoral law (e.g. paying agitators). To match Avakov’s resources of violence (National Militias and the police), the president’s team has its own assets: the General Prosecutor’s Office and the Security Service of Ukraine (SBU) are controlled by Poroshenko’s loyal allies. In turn, the SBU has close ties to another far-right group, C14, which gained notoriety by initiating a series of Roma pogroms last year. This potential for the escalation of violence introduces an unconventional criterion for assessing a candidate’s chances: their ability to “defend their results” – in the courts and electoral commissions, but also in the streets. Meanwhile, a candidate lacking in these vital resources currently leads the polls: popular comic Volodymyr Zelensky, who announced his decision to run for president on New Year’s eve to the surprise of many. 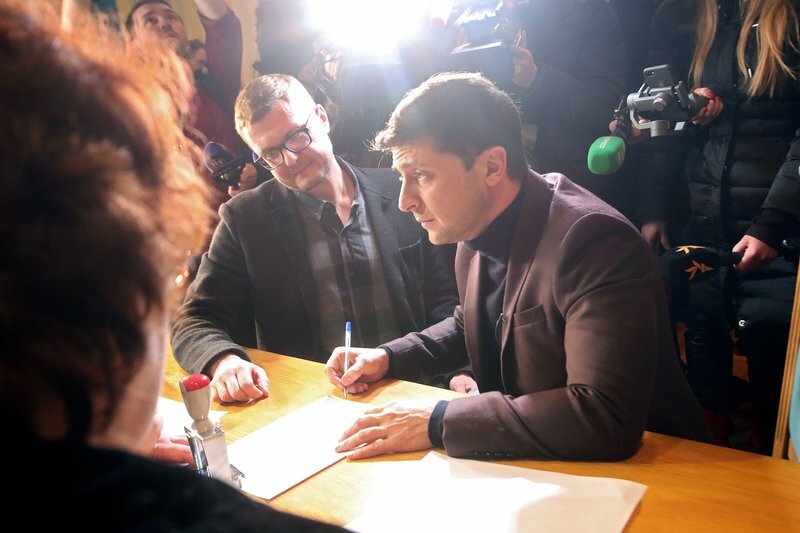 Being a much desired “new face”, Zelensky quickly became the leader of the race, especially among youth voters. His weaknesses include a less mobilised base and a lack of experienced lawyers and street fighters to match the resources of his competitors. Poroshenko’s team calls Zelensky a puppet of oligarch Igor Kolomoisky. And indeed, Zelensky has worked at Kolomoisky’s media holding, and the comedian’s jokes have usually been consistent with his patron’s political agenda. It is also true that Kolomoisky has been, at least historically, close to Yulia Tymoshenko. The billionaire, lionised for his support of the new regime in 2014, was among the greatest winners of the Maidan revolution until he became one of its greatest losers. Kolomoisky’s conflict with Poroshenko in 2015 made him the principal victim of the oligarch-president’s “deoligarchisation” policy: his bank was nationalised, and many industrial assets of Kolomoisky’s Privat Group have been lost or almost lost. He has a lot of issues to settle with the current government, and these elections are crucial for his fate. Strangely enough, another oligarch has fared much better under Poroshenko’s rule. According to an investigation by Ukrainian media Novoye Vremya, Rinat Akhmetov seems to benefit from an informal agreement with the incumbent president, which allows him, for example, to sell coal from his mines to heating and power plants at exorbitant prices. Akhmetov exercises informal control over the “pro-Russian” Opposition Bloc political party, which nominated Oleksandr Vilkul, a former CEO at Akhmetov’s metallurgical enterprises, for the presidency. Another candidate appealing to the “pro-Russian” voters, Yuri Boiko, is relying on the resources of yet another oligarch who has known better days, Dmytro Firtash. But while there are no realistic expectations of victory for candidates like Boiko and Vilkul, the stakes are extremely high for Poroshenko, who could lose everything after the election. The stakes are also high for Yulia Tymoshenko – this is her third and perhaps final effort to reach the top position in the state. Finally, her alleged partner Kolomoisky risks losing his empire if he fails to ensure the victory of a candidate loyal to him. Given the high tolerance for the use of violence, extremely low levels of public trust towards the political elite, and the general background of the ongoing war, the chances of an “unconventional” outcome at the elections are considerable. The incumbent president has the widest number of options. One scenario – an attempt to cancel the election by introducing martial law following an incident in the Azov sea – was tried in November. It failed thanks to two factors: stubborn opposition in parliament and “clear signals” from “our Western partners”, a Ukrainian euphemism for the US and EU. One can only hope that Ukraine’s dependence on the West is sufficiently high to eliminate the possibility of a similar disruption in the coming weeks, e.g. following a sudden flare-up on the front or an escalation of violence elsewhere in the country. Even if Ukraine emerges out of the presidential elections unharmed and with an orderly transition of power, the period of trials will not be over. Parliamentary elections are scheduled for October, and the country will almost immediately plunge into the new electoral campaign. In Ukraine’s semi-presidential system, control over the parliamentary coalition is no less important than the position of president. Whoever wins the spring race will need to repeat the result in the autumn. The parliamentary elections are likely to be even more chaotic and prone to violence than the presidential campaign. Besides the “centralised” competition between parties according to the principles of proportional representation, there will be separate campaigns in majoritarian districts. This will be the arena where traditional oligarchic electoral machines will clash or cooperate with local political-criminal groups and patronage networks, as well as ambitious upstart projects such as Zelensky or the likes of National Corps. Don’t change the channel.